Successfully Added Ultra-HD 4K Action Camera - 4x Zoom, IP68 Waterproof, 170 Degree Viewing Angle, 1/2-Inch CMOS, 2-Inch Display, Wi-Fi (Silver) to your Shopping Cart. Featuring an extremely compact and portable design, this 4K action camera can be easily carried along no matter where you go. Coming with numerous attachment pins, this action camera can be attached to surfaces such as your helmet, bike, and a whole lot more. Its IP68 waterproof casing even allows you to record the sharpest of images on a dept of 30 meters under water. 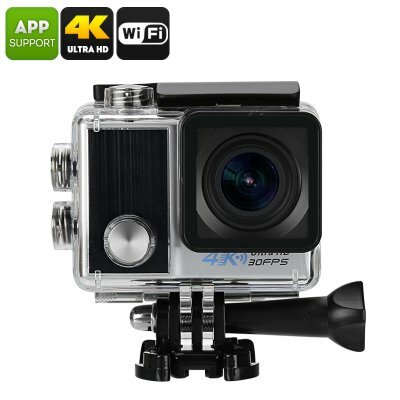 Whether you’re into diving, mountain biking, or snowboarding – with this 4K action camera at your side you can be assured that all your adventures will be captured in mesmerizing detail, allowing you to relive all your memories once back home with friends and family in the safety and comfort of your own living room. Holding a 1/2-Inch CMOS sensor, this little action camera is capable of recording highly detailed images. With its 170 Degree viewing angle and 4x digital zoom option you can be assured that nothing in your surroundings will stay uncaptured when this gadget starts recording. Coming with a 2-Inch LCD display, this action cam allows you to instantly watch back and review all your recordings at the spot, ensuring that all your footage is of the highest possible quality. Wi-Fi support additionally lets you share all your video’s and pictures with friends and family back home – allowing them to have a taste of your outdoor adventures even though they’re not physically there. Packing a whopping 900mAh rechargeable battery, this 4K sports camera lets you record up to 50 minutes continuously – providing you with enough time to record the most important happenings on each of your upcoming trips. By supporting numerous different recording modes, this action camera is the perfect little gadget for outdoor enthusiasts, extreme sports junkies, or people who simply are searching for a compact 4K camera to capture footage of their upcoming holidays.